Mitsy Fredrickson is in serious need of a distraction. With the ink still drying on her divorce papers, she flies to Scotland determined to forget about her own problems by helping her best friend re-enter reality. She knows Bri's claims that she is able to travel back in time and is currently living in the year 1647 are a lie but, instead of locating her friend, Mitsy falls prey to the same magic and is quickly forced to believe the impossible. Modern and sassy, Mitsy finds few in the 17th century who know how to take her fiery personality, but she finds her match in Baodan, laird of McMillan Castle. He is her opposite in every way, yet she feels balanced in his presence. The more time she spends with him, the harder she falls. She suspects he feels the same way, but something is holding him back - a dark secret from his past that even Baodan doesn't fully understand. Mitsy works to uncover what is hidden in the hopes that with resolution, Baodan will be free to love her. But the truth is darker than she expects, and it threatens to destroy them both. I enjoy listening to this series. I am forever hooked to this author. Great work. Some ppl say not like Outlander ands its not. But, its not meant to be. It is a fun easy listen about time travel to the Scottish highlands. There is something to be said for not being overwhelmed by excessive details and descriptions. Morna's Legacy has great flow, relatable characters and good storytelling. Love Beyond Hope.. I loved this one. This novel was exciting. Had more action and kept me wanting to keep reading. So I did all day until I finished. Awesome. Can't wait until my next book. Medieval Time Travel with a side order of Sass! What did you like best about Love Beyond Hope: A Scottish, Time-Traveling Romance? What did you like least? I really like the characters. Bethany Claire (the author) has a way of making you like these characters, even when they are in the most ridiculous of circumstances. What I liked least was that the main female character, Mitsy cussed like a sailor! This was supposedly her way of showing that she was sassy and was a thoroughly modern 21st century female. The relationship between the brothers was the most interesting. Also seeing what it takes to heal Baodan's heart kept me involved in the story. The least interesting was unfortunately the mystery plot. The villain was so obvious within the first 1//4th of the book that there was no mystery left to that plot line. Lily is a very nice narrator. Her voice is pleasant to listen to. BUT, these books are based in Scotland, with a modern American thrown in for flavor. But Lily uses no accents. All her voices sound the same. Do you think Love Beyond Hope: A Scottish, Time-Traveling Romance needs a follow-up book? Why or why not? All in all, I love this series. It's snack food reading. Light, fun, and after you've had some, you want some more! If you could sum up Love Beyond Hope: A Scottish, Time-Traveling Romance in three words, what would they be? What other book might you compare Love Beyond Hope: A Scottish, Time-Traveling Romance to and why? There is no comparing this series to any other story, it is in a class by itself. I really don't have a favorite. Lily does a wonderful job with all of the characters. I can't wait to sit down and listen to the story when she tells it. Her voice puts me right in the middle of the story. I have read all of this authors books, but this one is a personal favorite. Bethany has all the elements for a great story in this one intrigue, romance , humor, and time travel. 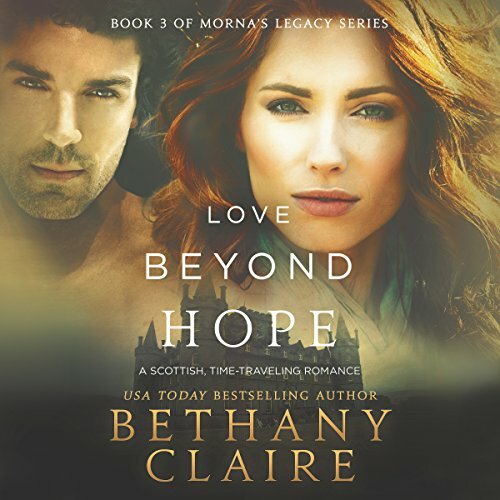 What made the experience of listening to Love Beyond Hope: A Scottish, Time-Traveling Romance the most enjoyable? I had already read the book but the narrator really brings the characters to life and enhances the story itself. What was one of the most memorable moments of Love Beyond Hope: A Scottish, Time-Traveling Romance? Mitsy and Baodans are complete opposites, she's sassy and he's quiet and demanding. But as they say opposites attract. But there is something funny going on and Baodan must fine out what it is. This is a SPECTACULAR Read! This story will have you LOL and If you love romance this is definitely a fabulous choice for your TBR list. I am hoping there will be a lot more exciting time traveling stories.